Spring is in the air! The winter rains have subsided, flowers are blooming, and warmer temperatures are here. I am currently writing this while sitting on our patio, listening to the birds chirp and watching our dogs eat grass (dogs are weird sometimes). I’m not going to lie, I am probably going to sit here all day…it is that relaxing! Easter is coming up and I find myself thinking about how big of a holiday it was for myself and my family when I was young. Before we moved away from our extended family it was a full day of aunts, uncles, cousins and grandparents on both sides of the family. Lucky for me, that meant twice the amount of food and a lot of Easter candy!! My favorite part of the day was Easter egg hunting. The idea of a giant bunny hiding eggs just for me to find was very exciting. When I found out that my parents were hand painting the eggs late into the wee hours of the night before Easter, my mind was blown. How cute are they! Some of the eggs would even have our names painted on them so that we could each find our very own special egg. I may be an adult now (debatable sometimes) but I like to think the magic of the Easter bunny can be kept alive! 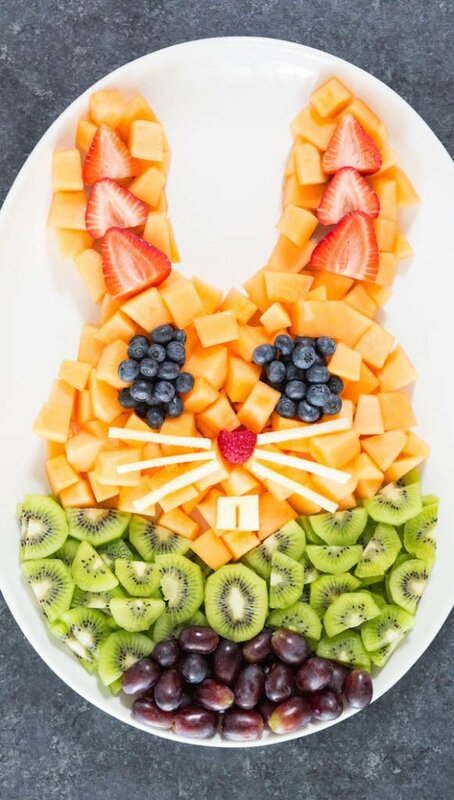 I may not make it home to go Easter egg hunting with my siblings, but I’ll feast upon this Easter bunny fruit tray and take a trip down memory lane remembering all the good times we had. I think this little guy turned out pretty good and you know what?! He was delicious;-). Fruit is so light and refreshing, just what you need on a lovely Spring day! You can feel free to substitute other fruits you may like. Let us know if you did add or change something, we’d love to see your version. I recommend making our red wine fruit dip to go along with this easter fruit tray. First, arrange the kiwi into the shape of a bowtie towards the bottom of your plate. I used the 3 full slices in the middle and then added the halved slices on each side. Next, add the cantaloupe in somewhat of a horizontal oval above the bowtie and add the ears on top. Inside the ears place the cut strawberry halves, with the inside of the strawberries facing up. Place the grapes at the bottom of the plate underneath the bowtie. 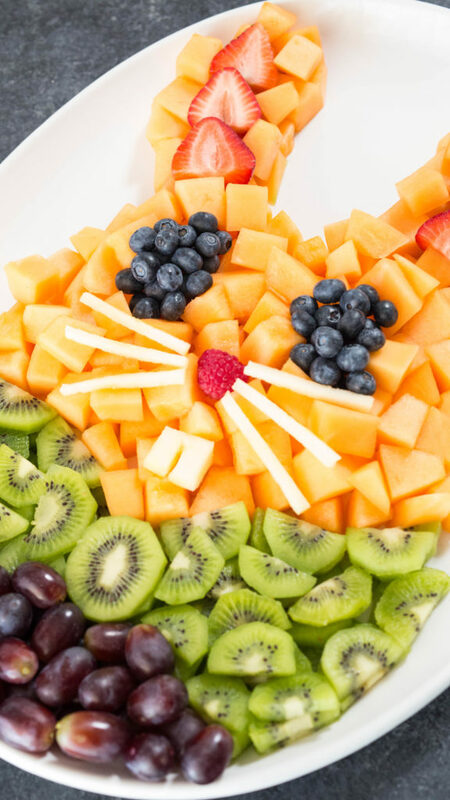 Add the blueberries as the eyes, the raspberry as the nose, and the apple pieces as the whiskers and the teeth. 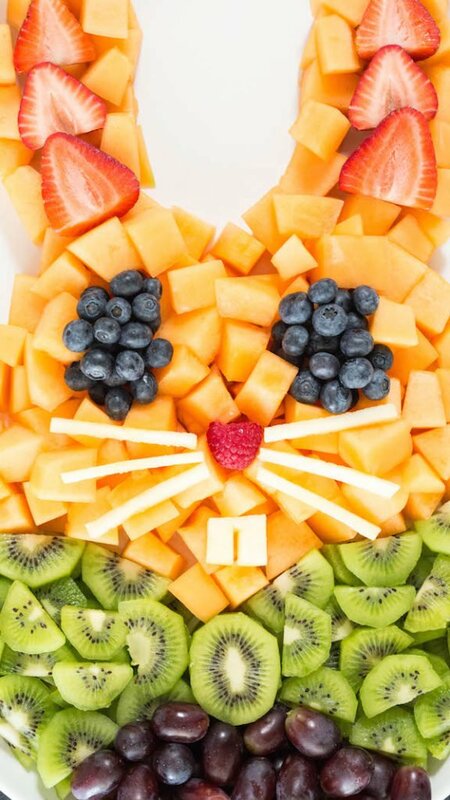 Grab some fruit dip and chow down while hunting for some Easter eggs!